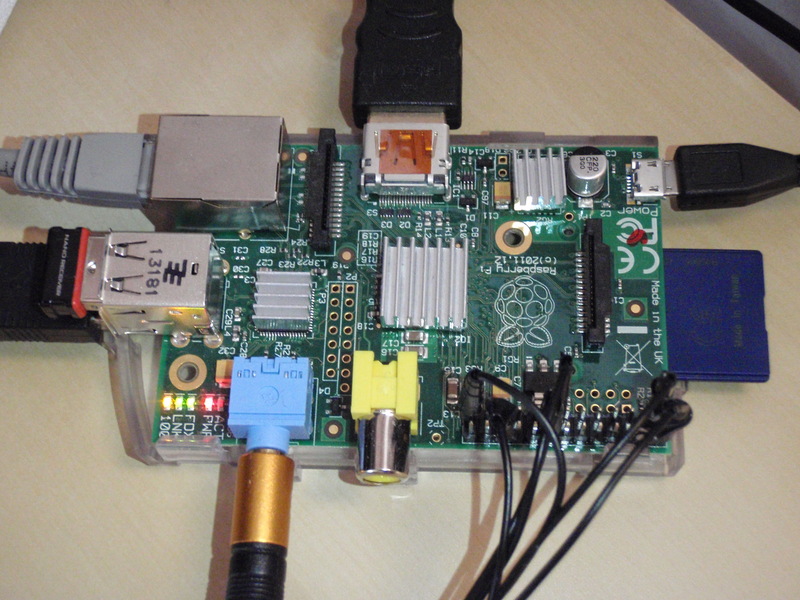 So, I got myself a new gadget for christmas: A Raspberry Pi model B. For those of you who are not familiar: It’s basically a credit card sized computer with the computing power of a cell phone. Well, a somewhat slow cellphone to tell the truth. Not really the right device to do any fancy computing. One really cool thing though: the integrated BCM2835 chip has a built-in GPU with support for full HD video encoding/decoding and OpenGL 2.0 ES. And all at the power consumption of about 3.5 Watts. Perfect for a little, always on, media center to stream youtube videos and music or watch movies! First thing, I loaded XBian, a Raspberry Pi optimized Linux distribution with XBMC preinstalled onto a memory card and booted up. Worked like a charm, out of the box you get a full media center solution with support for video playback and audio streaming and plugins that let you browse youtube and dailymotion. Sweet! Up to that point I had used my mouse as input and this was getting a bit tedious: A mouse to control the Raspberry, one remote to control the TV and another one to control the sound bar. Way too many devices with a two year old kid running around ;). So I decided to simplify the system. The Raspberry has eight general purpose input/output (GPIO) ports. They can quite easily be programmed and thus used to control all sorts of electronic circuits. 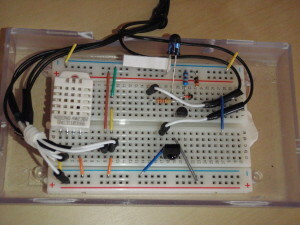 At first I hooked up an IR receiver like shown in this Adafruit tutorial. Once I had configured LIRC this allowed me to control XBMC with any remote control. 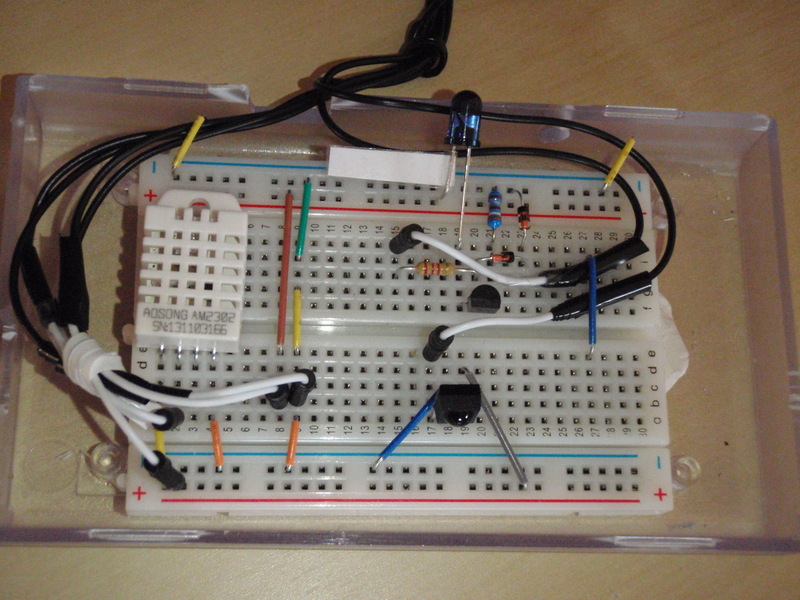 Next I built an IR sender circuit like described here. This allowed me to send IR signals as well. As a final step I configured my programmable remote to mimic some device unknown to TV and sound bar and used lircrc in combination with irsend to control both. Let me illustrate with an example: The volume up button on my remote sends a volume up command which only the Raspberry can understand. Based on the contents of lircrc, the Raspberry then sends the appropriate volume up command for the sound bar. Likewise, a channel up command will be translated to a command for the TV. This allowed me to get rid of two of the three input devices as everything can now be controlled with one remote only. I should probably add that I struggled for quite a while to get this to work reliably. Sometimes the TV would not react, sometimes multiple button presses were sent etc. Finally it turned out that the issue was related to the low processing power of the CPU: Under heavy load, lircd would be interrupted by the OS quite often in order to run other tasks and thus mistimed the IR impulses. The issue went away once I increased the priority of the lircd daemon. This project was so much fun that I started to to look into something else: What about supervising system and network stats? So I wrote a little python script that would grab internet transfer stats from my router, and temperature and free memory from the on-chip sensors in the Raspberry. 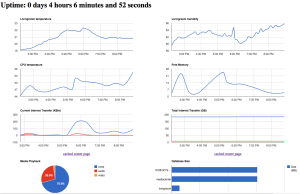 The script would run every 5 minutes and log the results to a mysql database. 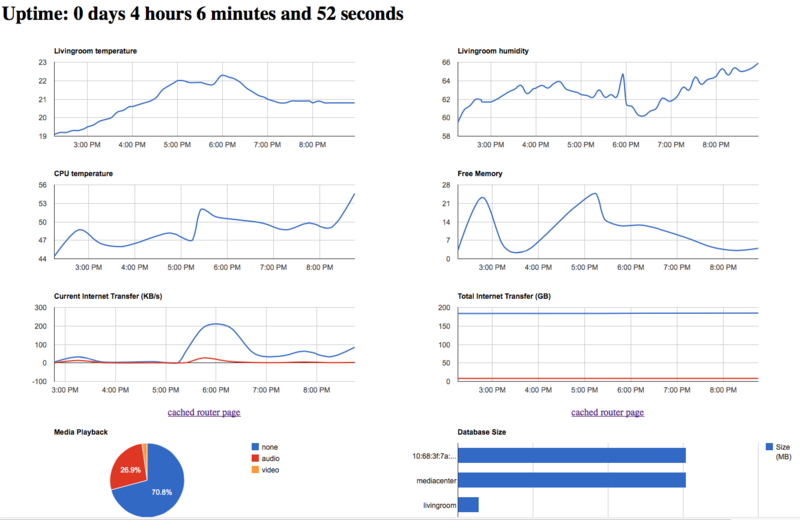 I then installed the apache web server and made a little website that shows the data in some neat charts. Some weeks later I also hooked up a temperature and humidity sensor to one of the free GPIOs. And as the last project (for now 🙂 ) I built a custom tracker for my cellphone: I configured my phone to send a HTTP POST request with the current location to my public IP address (which I set up via dyndns). 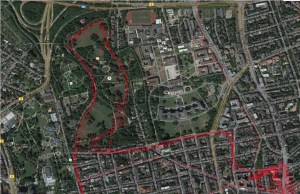 A php script then extracts the location and stores it to a database. 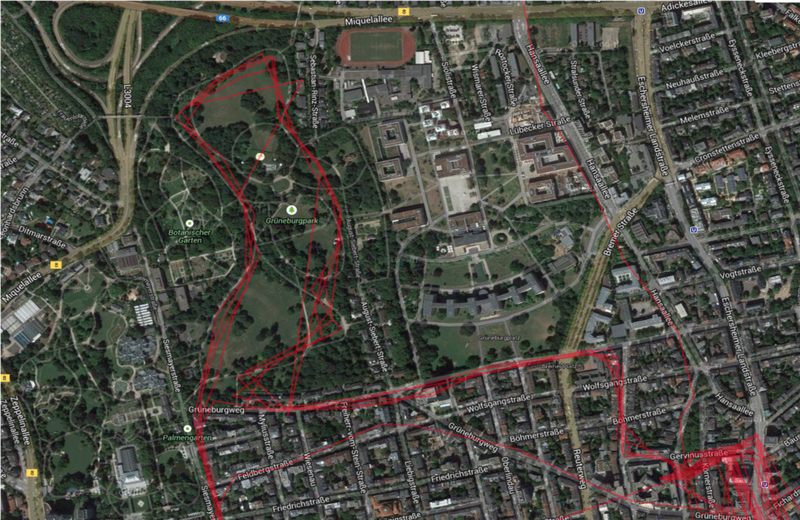 Another small webpage then displays the data via the google maps API. And thatâ€™s it for now. Definitely a lot of fun and a nice departure from graphics programming. Note that Iâ€™ve left out a lot of the gory details, like the components in electronic circuits, or patching the lirc GPIO driver to fix some problems with IR inference from energy saving lamps. Donâ€™t hesitate to contact me in case youâ€™re interested and I can send you some more details. Exciting stuff ahead: Iâ€™ve decided to start working on a new project!! To be honest: itâ€™s about time, I havenâ€™t worked on any personal stuff since my BSP tree sample and Iâ€™m itching to get my hands on some exciting project. Even better still: My friend Ryan Lewis, an amazing 3D artist and tech guy is on board as well! So, what will it be? Well, this time Iâ€™m going to tackle something new: Skinned animation. A while ago, Iâ€™ve come across an interesting paper about using dual quaternions to represent rigid body motion. As we all know, unit Quaternions are an efficient way to represent rotations in space, eliminating a lot of the problems inherent to matrix representations. Unit dual quaternions extend the space of representable transforms to include translations as well. As it turns out, interpolating between rigid body motions can be approximated by something as simple as computing a weighted average of the corresponding unit dual quaternions and a normalization of the result: which makes the use of dual quaternions for skinning very efficient and suitable for GPU implementation. Another more recent paper that caught my attention is Crytekâ€™s definition of QTangents. While based on the pretty straight forward idea of representing Tangent Space by a unit Quaternion, Crytek applied their engineering ingenuity and managed to losslessly compress the resulting unit quaternions down to four floating point components without introducing singularities. In their optimized setting this brings the data requirements for tangent spaces from eight 16bit floating point values down to four 16 bit floating point values. Doesnâ€™t sound like much, but consider the hundred thousands of vertices that get pushed through the graphics pipeline every frame. And remember, on consoles every byte of main and video memory counts!